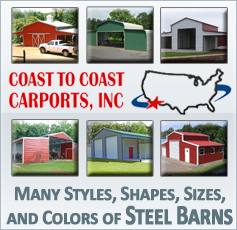 A good steel frame barn can do a lot of things for you, especially when that barn is built by Coast to Coast. There are a lot of things that go into every steel building at Coast to Coast, not the least of which is the highest quality 12 and 14 gauge steel in every frame. That kind of craftsmanship means that you are going to have a good steel frame barn for a very long time. Every steel building made at Coast to Coast comes with a 10 year warranty on rust through of framing on roofing material assuming normal user care and maintenance. There is no better warranty in the business, and 10 years means that you are going to be using that barn for a long time. Why not make the best investment you can and get a barn that you know that you will be proud of? Coast to Coast barns are not only built to last, but they are built to look good doing it. Wooden barns need painted almost yearly, and look terrible after a hard storm or a harsh cold spell. And that paint fades quickly in the hot sun too. 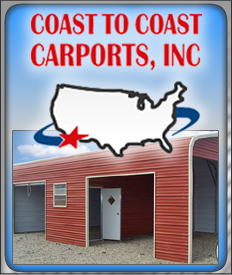 A good steel frame barn from Coast to Coast does not need to be painted like a wooden barn, and when you order, you can pick any one of 12 different colors for your set up. Imagine being able to ensure that your barn looks good next to your home or equipment. Isn’t that worth taking a look at? Your barn needs to be a good fit for you too especially when it comes to a steel frame barn type. That’s why you can customize your specs for your next barn with Coast to Coast. An extra window or door, you’ve got it. Another few feet of extra space, done. The options are endless and you are truly the designer. Come talk to us today, and find out about the best investment you can make.